La Liturgie ou Formulaire des Prières Publiques à l’usage du Collège Royal et des Ecoles Nationales d’Hayti. This first translation into French of Anglican liturgical material for use in what is now Haiti was published, likely between 1815 and 1820. 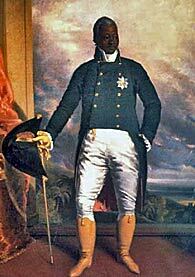 This was done through the instigation of Henri Christophe, the King of Haiti (actually only of the northern part), as part of a great number of wide-ranging changes he sought to bring to that country. After his death in 1820, the country was reunited, and the introduction of Anglicanism as an official religion was forgotten. The following typescript note bound with this book provides a more detailed account of the circumstances surrounding its production. When Henri Christophe became ruler of Hayti he consulted William Wilberforce on a national form of prayer for Hayti. Mr. Wilberforce’s advice was to adopt the Liturgy of the Church of England. When Sto. Domingo [i. e., Haiti] broke away from the tyranny of the French republic, as France had recently done from the mild sway of her King, a state of things arose in the Colony, which led in quick succession to several forms of government. Amongst others a monarchy was set up with General Henri Christophe as its head under the title of “Emperor of Hayti.” To the honor of this noble Prince his first thought was to establish a national religion; and I was on a visit to Dr. Haggitt at Frenchgam when he received a letter from Mr. Wilberforce inclosing one from Christophe asking advice and assistance in so weighty and all important a matter. The letter was exceedingly well expressed, and abounding with excellent and, to appearance, unfeigned sentiments of piety. I need scarcely say that Mr. Wilberforce lost no time in answering so interesting an appeal; and his advice was to adopt the Liturgy of the Church of England, which gave rise to the publication of this volume. This correspondence apparently took place in 1815. William Muss-Arnolt’s Book of Common Prayer among the Nations of the World (1914) does not mention this historically important diglot publication; it is listed as 36:36 in David Griffiths’s Bibliography of the Book of Common Prayer 1549-1999 (2002). Thanks are due to Richard Mammana, who transcribed the text from a copy belonging to Thomas Rae.